Germans ring in the New Year with a Grosse Neujahrs-Breze, or Big New Year's Pretzel. This braided sweet yeast bread shaped like a pretzel is the first thing many Germans put into their mouth when the clock strikes 12 on New Year's Eve because it is thought to bring good luck. Try serving this German good-luck symbol as the centerpiece of your New Year's Day brunch. This bread also makes a wonderful edible gift for a hostess because it is so decorative. While you're at it, brush up on how to be the perfect guest in a German home. Measure or weigh flour into a large mixing bowl. Proof the yeast by dissolving it in 1 cup/250 ml warm milk with a pinch of sugar. Leave it in a warm place for about 15 minutes. When bubbles form, add it to the flour together with 1 whole egg, butter, salt, and lemon zest, and work it into a medium-stiff dough. Knead for several minutes or until dough becomes smooth and silky. Form it into a ball and place it in an oiled bowl, turning to coat. Cover with a clean towel or plastic wrap and let rise in a warm spot for 15 minutes. Sprinkle a large tabletop or another work surface with flour and turn dough out onto it. Turn once to coat. Divide into 3 equal pieces (it helps to weigh them, not just eyeball them). Roll each into a 1-foot-long cylinder and let rest for a few minutes (this helps relax gluten). Starting in the middle, lengthen the dough into a rope by rolling against the table top and applying pressure outwards. The middle should be thicker than the ends. 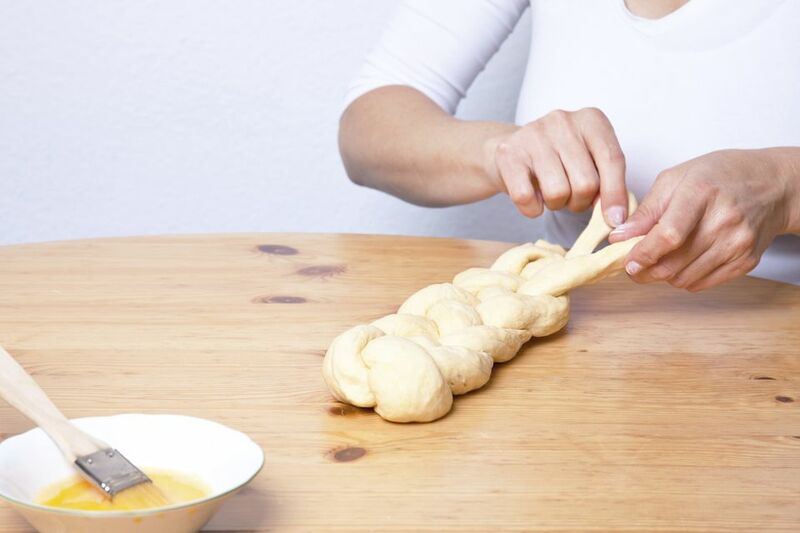 Continue this way until you have three strands of dough at least 3 feet/1 meter long each. If dough continues to spring back, let it rest for a couple minutes and try again. Beginning in the middle, braid the three strands together towards each end. Pinch the ends closed. Lengthen the braid slightly by pulling on the ends. For good luck: Place several foil-wrapped coins (lucky pennies—Glueckspfennige) between the braided strands. The person who finds a coin has their New Year's wish come true. Form braid into a pretzel shape and place on a parchment paper-lined cookie sheet. Cover with a clean dish cloth. Place the oven rack on the second shelf from the top. Heat oven to 350 F for 30 minutes. Make an egg wash with the egg yolk beaten together with 3 tablespoons of water. Brush the braid with it. Bake for 30 to 40 minutes. Let cool completely on a wire rack. If you are serving the bread the same day, sprinkle with sugar for decoration. If the bread is to be kept for several days, frozen or shellacked, do not sprinkle with sugar, as it will make it soggy.